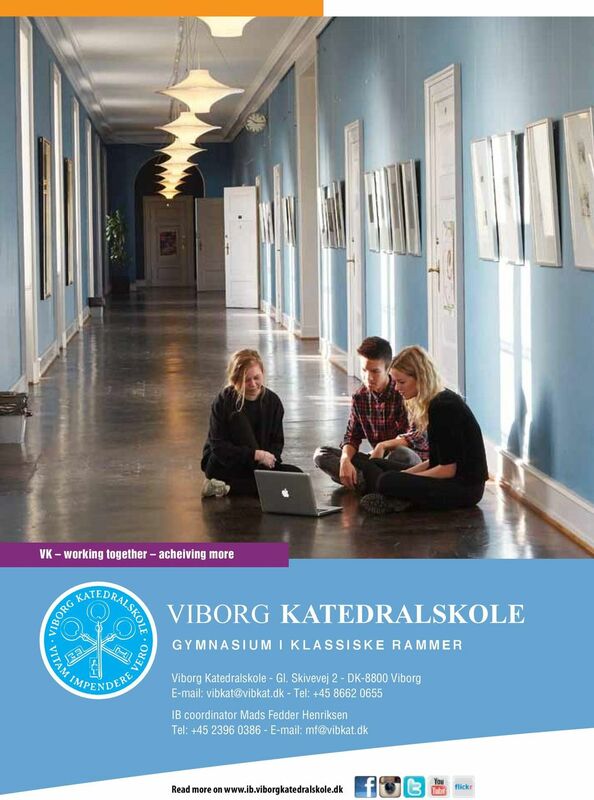 Download "Viborg Katedralskole 2016-17. International Baccalaureate. International Baccalaureate FORSLAG A FORSLAG B FORSLAG C"
6 Admission into IB and PreIB IB You may be eligible to enter the two-year IB Diploma Programme if you have finished 11 years of schooling, for instance the first year (1g) of the Danish Upper Secondary School Leaving Examination (stx) or have comparable international qualifications, such as at least five IGCSE subjects, among these Math, English and one science subject or Combined Science. You must have a solid basis in mathematics and be very good at English to enter the IB Programme. Every applicant will be assessed individually. 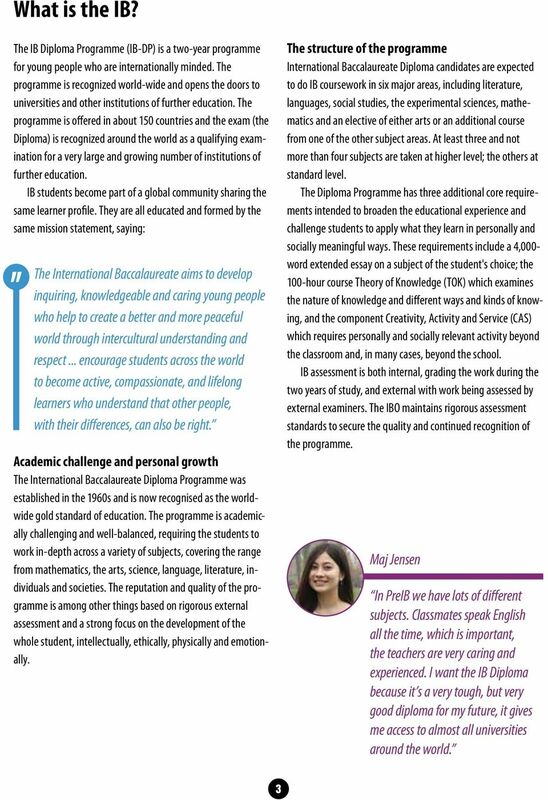 Apart from the relevant schooling you must also show that you will work towards IB Diploma Learner Profile. To evaluate this we ask you to write a short personal statement and enclose it with the application form. We reserve the right to carry out an admission test in Mathematics, English and your chosen science subject prior to admission. 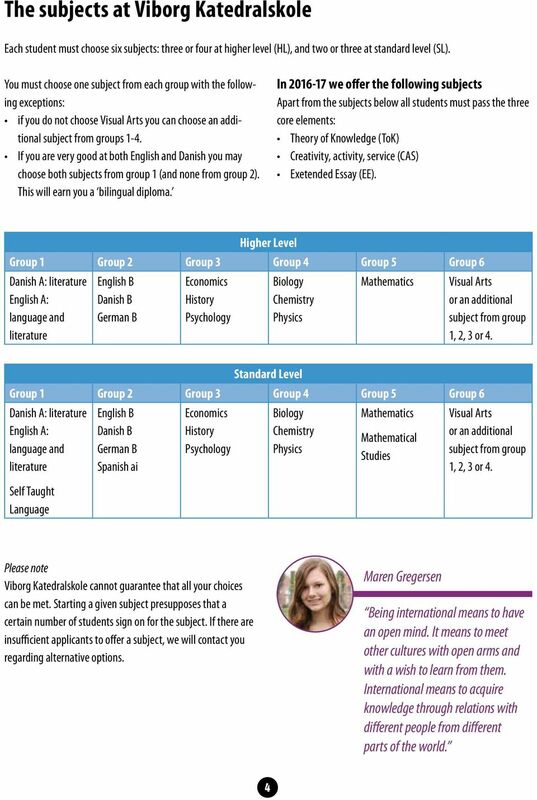 The IB application form must be mailed to the IB coordinator, Mads Fedder Henriksen The deadline is March 1, but please contact the IB coordinator for possible vacancies if you missed that deadline. 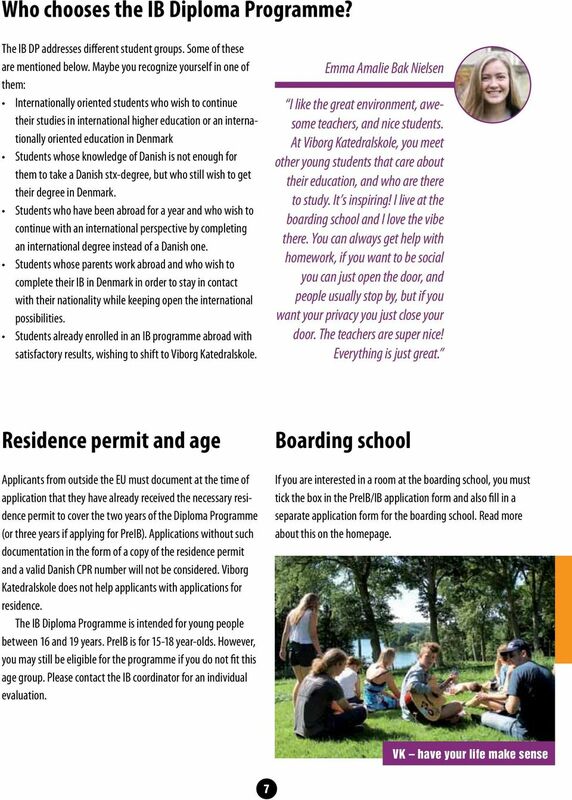 An electronic pdf-form can be found on the homepage. 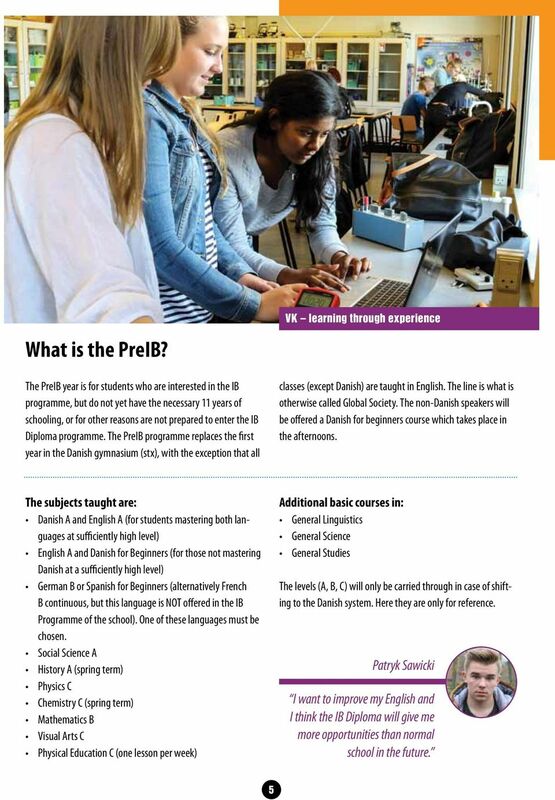 PreIB If you do not meet the entrance requirements for the IB Diploma Programme, you can be enrolled into our PreIB course, a one-year preparatory course, also with English as the teaching language (see details above). 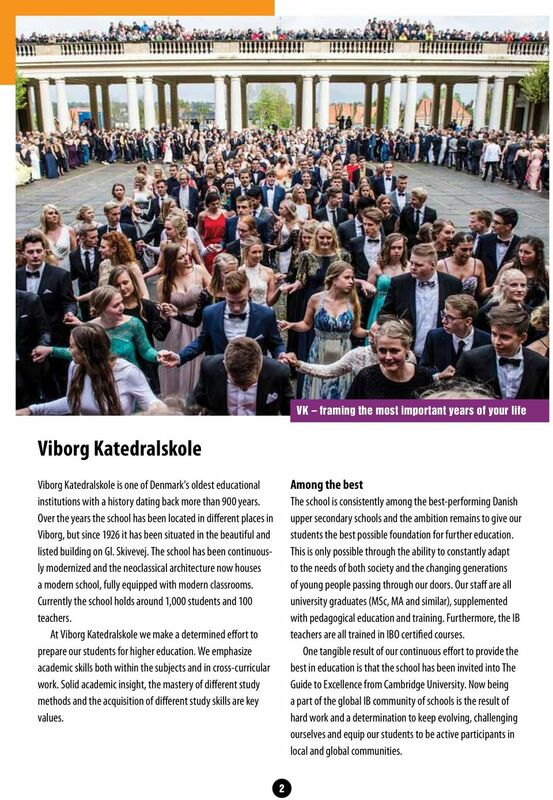 The course is not part of the IB programme, but is equivalent to year 1 in the Danish (stx) school. Entrance requirements here are the Danish 9th or 10th grade leaving exams from Folkeskolen or equivalent international exams. If you have completed PreIB with satisfactory results and have demonstrated solid skills in the subjects relevant to the IB and a willingness to learn, you will be transferred directly into the IB Diploma Programme after the PreIB year. Applying fra a Danish school When applying for PreIB directly from a Danish school, you must apply through optagelse.dk. 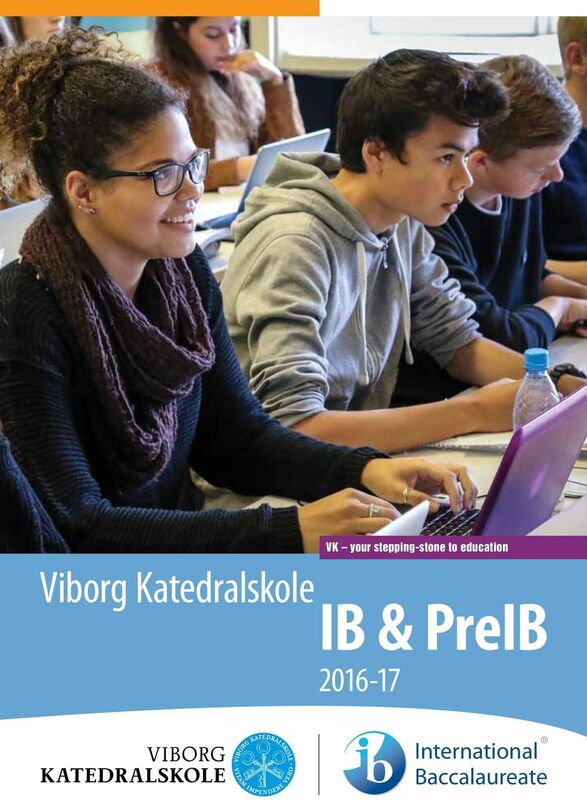 Deadline for applications for the school year is March 1, You must also send the PreIB application form directly to Viborg Katedralskole. An electronic pdf-form can be found on the homepage. 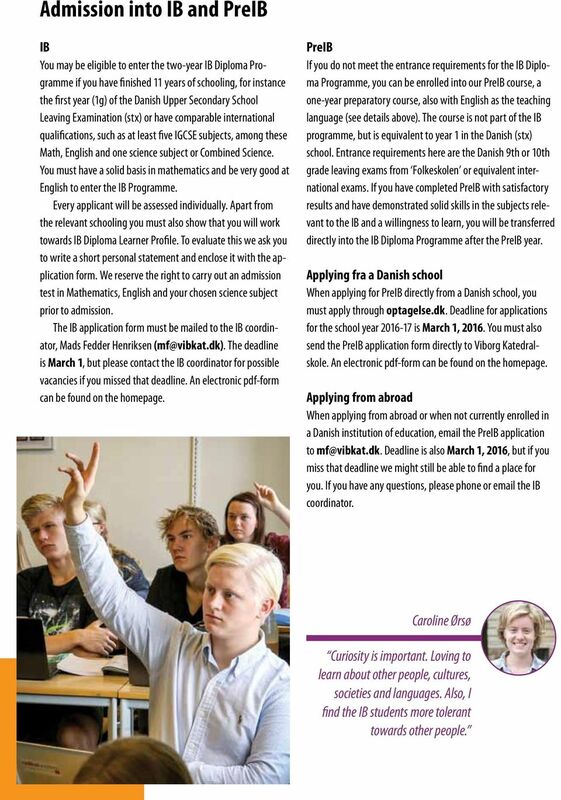 Applying from abroad When applying from abroad or when not currently enrolled in a Danish institution of education, the PreIB application to Deadline is also March 1, 2016, but if you miss that deadline we might still be able to find a place for you. If you have any questions, please phone or the IB coordinator. Caroline Ørsø Curiosity is important. Loving to learn about other people, cultures, societies and languages. Also, I find the IB students more tolerant towards other people. Quarterly News May 2015 UPCOMING EVENTS 18.05. - 22.05.15 Secondary Camp Week 20.05.15 Primary Parent Rep Meeting 26.05. - 28.05.15 Grade 5 Exhibition 01.06.15 Grade 5 to Grade 6 Transition Evening 03.06.